My sign is "Out of balance", I tilt towards insane.. I tend to measure "self assured", as insecure and vain. The one's that say, they have no hope, measure off the scale..
Generally, I get off the track and let them self derail. My sign is "Out of Balance", I only lean one way..
Once I read "You're beyond all hope", that's usually how I stay. If you weigh me down with senseless views and claim to know it all.. I'll bend till the cup runneth over and watch you take a fall. 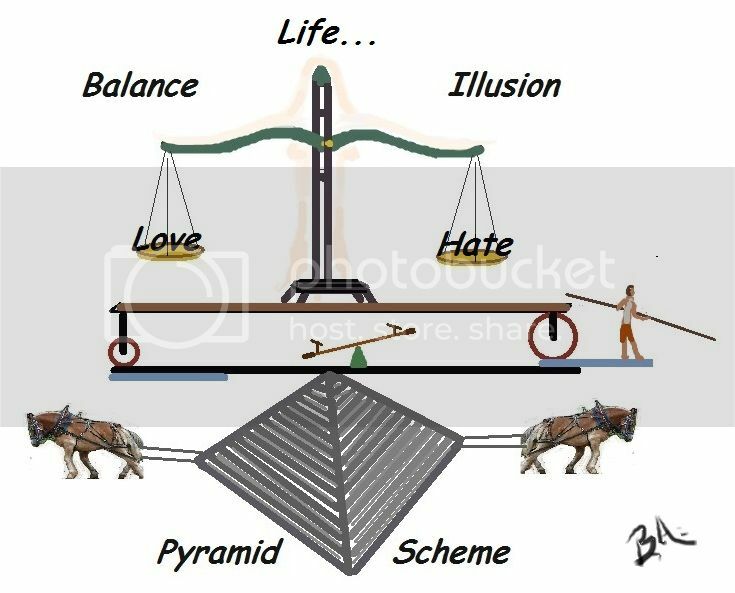 My sign is "Out of Balance", I only have one side..
You filled the trap with too much crap till your leverage went and died. My new sign is, "Out of Service", .....Take a hike, cause..... I Don't Care! My eyes are pretty dull aren't they? this is about my inability to be loved because I fear I am not beautiful enough. I promises, I would, and it is 8 AM already, I could take the dog, my only friend for a walk but the demons, who has took charge of my body since the past years are winning, I do not need to be doctors or some intellectuals medicals, the past two weeks, the decay of the mind has progress to the physical side of me. To be honest, I am confuse, right now, I spend in the past 24 hours stuffing myself, with 35 mg of xanax, don’t panic princess, I being on colourful pills most of my life and just took my Ritalin too, so I am a little confuse, damned, all I need his a good mixture of booze and cigarettes to finalize the cocktail! I remember, take it or leave it, because the past two weeks, I have committed the ultimate sin, slow suicide, no sleep, no eating, simply popping my brain with pills and booze, maybe I am too vain to died old and sick? I wrote form a very early age, due to personal circumstances, if one is not allowed to speak for 10 years, I sat on the kitchen table and draws and wrote, silence was crucial, if the beginning of the abuse was not to start. Forgive the silly foul I have turned too, the ghostly reflection I look in the mirror each days, slow decay, min mind is so weak, I almost think, it is time to end this decaying of the spirit I was, to many , it would come as a surprise! What happens? By the age of 21 years old, I had wrote tree novels, well, I had already left school by the age of 14, no O levels, but life still these days was the education, I wanted so I left and went to work. And IT IS WHAT I WAS TRYING TO TELL YOU, NEVER LEFT ANYONES BRING YOU DOWN, IT WAS WHEN I WAS 30 YEARS OLD THAT AFTER ACCUMULATING ALMOST A SUITCASE OF WRITINGS, DRAWINGS, PAINTINGS, that I turned up to an interview in one of the most five prestigious schools of arts in London, that I got accepted as a mature student, ( I forgot to mention I had leave my natal country, turn up to the UK, no speaking a words of English, except for the two verbs £ to be” and to have” but I knew two things already, back then, I knew what FORGIVENESS was a it is a gift and no something once learned and I was if not wonderful with words, I had realised, I could bleed on the page my emotions, maybe cos, I was lucky to understand, there is no rules, no teachings, no masters, but the simple knowledge, that if one could write in harmony with his soul and heart, whatever would sweat through the ink, would always be pure, honest, by then I was far from pure in my daily life. I run away, to the UK, as a teenager boy, with a single ticket, I shall never forget watching the French coast disappearing in the night. Yes, I made choice, and wrote extensively about it, while I first arrived to England, I would barely speak a word or understand but I was so young, my flesh save me to the street, actually not always, I spend some of 1989, as a homeless in a land I did not knee, father passed away few months later, too late to even go to his burial, but went I arrive to the grave of this man I barely knew, I was broken to witness, he had gone with so little, or so I did believe at the time. When the plane took me back with my tears, rolling inside me, I never ever cry from the outside, the painful dews always rolled inside me and I smile. This is when I could have pick anger, bitterness, all, she could have done was calling my mother family, who live 20 minutes walk away from my motherly tiny village, like a bird claiming it would have been the song, but no, she was my dad mother and despise she knew he had only days left to lived, and was begging her to see me, she robbed me from “what could have been the first honest talk with my blood and flesh! Re-enforcing, my faith that anger, bitterness, revenge was the demons inside us and from all the qualities, one true human posses the ultimate gift, I say GIFT, as this quality is no something one learn but born with: god forgive them, when the nails were tearing apart his flesh and the spire pierce his heart, still in his eyes, the same prayers was till there, bleeding as love is all. Which bring us back to what we were discussing, anger is only one letter close to Danger. I think , it is 9.30 AM, had not sleep for two days but taking Ritalin ( 56 mg) in the morning and a handful of xanax, take away all my feelings, emotions. Only few years ago, I was the soul of the party, the naughty boy, when exactly 1 year ago, I was told I had a chronic virus in my liver, who was attaching my all body, immunise system, kidneys. Apparently the good new is the result of my biopsy is between moderate and on a borderline to high. The bad new was from the different virus , I was told I had the most aggressive and like the other ones, who take 6 months of treatments and have many chances to kill the intruder, mine was the worse, meaning, I will have to suffer 1 year of chemotherapy and awful sickness but my chance for the treatment to succeed, well, as the specialist told me, you have only 1 chance, u virus is already to the stage of chronic phase, meaning he has damage my liver badly enough to scare my orgasms and my enzymes are bleeding inside my blood. oh ironic, my first attempt of suicide was when I was 15, by 17 I had my stomach pump three times and ended in my first experience of being in a coma. From that time, I have find with my words and creativity, the will to live for me, and stop breathing for others, many more attempts follows, if I am truly honest I, long, have lost the numbers of looking for the last exit. All I know is, I was 3 times in a coma, once when I was very young and the last time, 5 months ago. It does not matter why I did it, the answer to that, I already planted like some exotic poisonous flowers on those pages. But in some way lucky for me, I have no memories of the last week of my last goodbye, because I choose, a way, I had always promises, if I really going to do it, it would be the last method, I would use: Hanging myself! What happen I shall never know, I have no recollection of putting the metal chain around my neck and the padlock, all I know was, broken pieces of friends, doctors when I woke up in Reanimation, after days in a deep coma. Apparently, I was 3 minutes away from it all. The reason, no only, ambulances came, fire brigade and helicopter ambulance too, their close my road, but because I only had 3 minutes left, they pierce a hole in my neck and that all I know…. The rest, well, I wish I did saw the light when I was in a coma, but the lights were blacks! Since then, I have been swimming between shadows and dusty lights. But since then, even when the nights come, I try to keep as feeble as it is that tiny flicker inside me. + I have to have 1 year of chemotherapy and still being told I have 1 chance it might work. Otherwise….there is no point to think far headed. SO I WILL FINISH THIS WITH THE INTENTION IT WAS WRITTEN IN THE FIRST PLACE,, TRUST YOUR SOUL AND HEART, IF 1 TELL U TO WRITE VULGARITY, IT HAS HIS RESON AND BELIEVE U CAN TURNED IT INTO BEAUTY, SAME FOR THE OTHER ONE, AND WHEN YOU WILL TRUST AND YOU WILL KNOW WHEN THE TIMEHAS COME, THAT BOTH SOULD AND HEART ARE ONE, YOUR POETRY WILL SHINE LIKE SHOOTING STARS, YOUR FEARS TO GO TO FAR OR WRITE SOMETHING INNAPRPRIATE WILL DISAPEARS TOO, YOU WILL EVEN FIND YOURSELF CREATING NEW RULES, NEW PROSES, WHICH U HAVE NEVER DREAM OFF. I SEE A GIRL, WHO HAS BEEN TOLD TO MSNY TIMES NO TO DO SO RO THAT. I SEE IN THE FUTURE A WOMAN, WHO`S POETRIES WILL TAKE THE FEET1S OF THE GROUNDS TO MANY, JUST PLEASE, DON`T COMPROMISE, DON`T LISTEN, ONLY YOU, INSIDE THE CORE OF YOUR SOUL SHALL KNOW WHAT IS RIGHTS OR WRONGS. SMILE AND TAKE A PEN AND LET THE TALENT INSIDE YOU, WHICH IS BEGGING TO GET OUT, TO LET IT BLEED ON THE PAGE. REMNBER, ALL THE GRAND ARTISTS, WERE UNIQUE AND INDIVIDUALS. took me hours not even sure if i was trying to send you/ what, i really want to say.